"It was Saturday night and Las Vegas was buzzing, but nowhere more so than in the showroom of the Hilton Hotel. The date was December 4, 1976, and Elvis was three days into his 15-show, 11-day "Pre-Holiday Festival". Vernon and Lisa Marie were in the Presley booth near the front; the youngster had arrived for a few days' visit with her father. He marched in place during "America the Beautiful", and got a much-deserved ovation after the finale. Once Charlie handed Elvis the lyric sheet from near the piano, "Bridge Over Troubled Water" was beautifully sung. And Elvis only used it for the always-troublesome first verse. He unexpectedly began "What Now My Love", delighting the crowd with a version softly sung at first, the middle verses spoken dramatically, and the ending done at full power. It was the highlight of the show, and perhaps the entire season. Elvis enthused about a couple of special stars in the crowd. "They're some of the finest singers in the world, so that's why - one of the reasons I have to be good". The gentlemen in question were Engelbert Humperdinck and Roy Orbison, sitting in adjacent booths. Of the British idol, Elvis said that nobody ever sang "Please Release Me" like Humperdinck, while Orbison - in his trademark dark glasses - was "one of the finest singers of all time", and few would argue with that. Both men got warm applause and cheers. 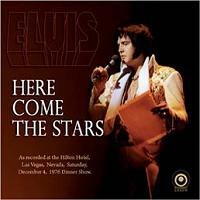 Elvis's vocal commitment was noticeable in "Hurt"; and it got a great reception. He threw in a rapid "Hound Dog", and then said the evening wouldn't be complete if he didn't sing "How Great Thou Art". This also received an ovation. The show had been very entertaining, full of fine singing and good humour".